Guanghua Temple Only open to the public on the 1st and 15th of each lunar month. 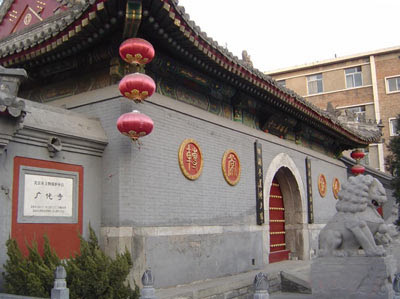 Located at 31 Ya'er Hutong, Xicheng District. Guanghua Temple is located at the foot of Fenghuang (Phoenix) Mountain, about two miles to the south of Putian City in Fujian Province. Fenghuang Mountain presents a verdant landscape: trees clothe the mountain in green and babbling brooks wander through woods. The study of Buddhism once flourished in this environment. Guanghua Temple has a long history. It was built in the Southern Dynasties (420-589) and became well known in the Tang Dynasty (618-907). During the height of its glory in the Song Dynasty (960-1279), over one thousand monks and nuns practiced Buddhism at this temple. Guanghua Temple was destroyed by fire during the war in the Yuan Dynasty (1271-1368), but had been gradually restored to its former glory during the Ming Dynasty (1368-1644). The temple housed around 60 monks in the year 1949, however the cultural revolution of 1965 took its toll on the temple and it was forcibly closed down. The deities and the statues of the temple were broken down and the monks had to leave the temple premises. Reconstruction work on the temple began in December 1980. In 1983, the 36-year-old Master Yiran assumed the role of the head monk of the temple and later, in 1990, the 24-year-old Master Xuecheng replaced him. As of today, the temple is open for public on the 1st and 15th of every lunar month. 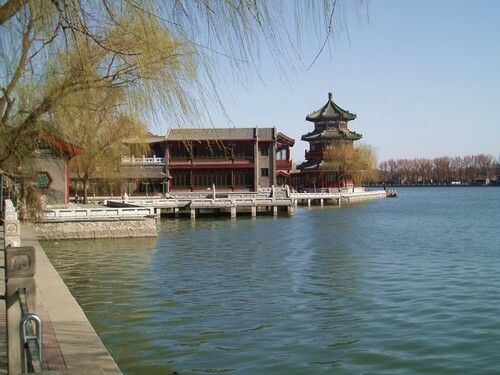 The maon structures inside the tempple include Gaoshan Gate, Tianwang Palace, Jialan Palace, Sanzang Palace and Dizang Palace. Apart from this, there is also a 10 m srone staircase with 199 steps infront of the temple.